Nepal is known around the globe mainly as a land with the world’s highest mountains, which adventurers flock here to scale. What is less well-known is that climbers can also literally go into the mountains. Nepal is also a land of caves, and the most cavernous of them all is Siddha Gufa in Tanahu. In fact it is said to be South Asia’s largest cave in terms of the subterranean area it covers. For cavers, this is a bonanza because much of its dark and forbidding innards have yet to be explored. 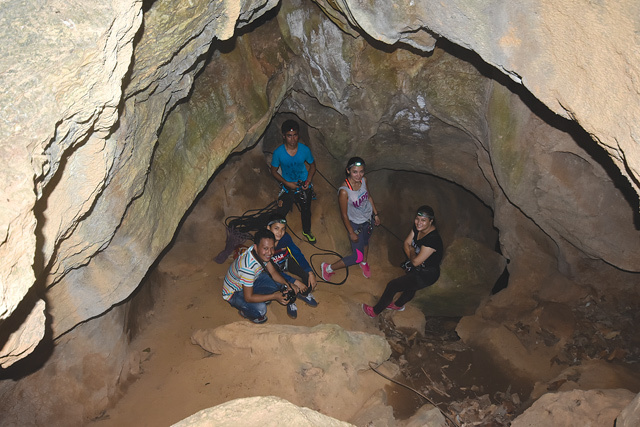 Siddha Gufa was discovered a decade ago, but introduced to thrill seekers for adventure caving only in 2014. For this second feature in the series, Suzana Shrestha — a famous stunt biker in the area and also Miss Tanahun for 2015 — agreed to show us around. Hiking from the highway with the afternoon sun blazing down on us was quite literally an uphill task. At the cave opening, refreshingly cool air gushed out. “The air is chilled by the cold limestone inside the cave, we call it natural AC,” grinned Suzana. As with all adventure activities, the guide started with safety instructions. Being well-acquainted with the gear, I did not pay much attention, little realising that it would eventually cost me a bruised palm. Lesson learnt: always be attentive to instructions. There are two levels in Siddha Gufa from where to rappel. The first 6 m felt very much like a pre-adventure drill because of its short length. 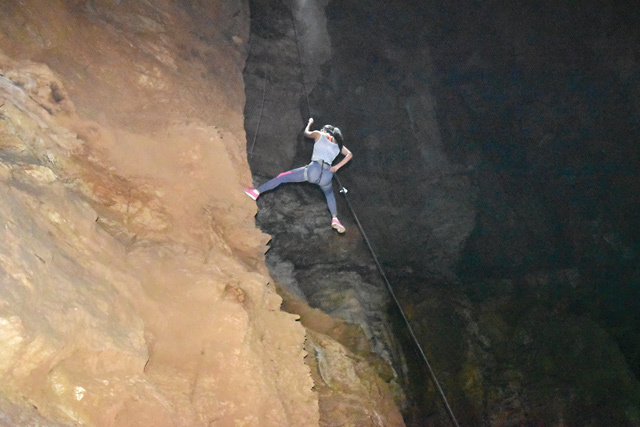 The second is the real deal: a 70 m vertical drop in pitch darkness. Head-band torches are of little help, and the light attracted insects. My second level started on shaky ground; in fact, there was no ground. I was used to rappelling with my two feet planted against a surface, but this one had me dangling in the air. After confirming — and reconfirming — with the guide that there were absolutely no other options I, um, caved in. I had to keep abseiling in this manner until I came along a limestone surface on which to set my feet. 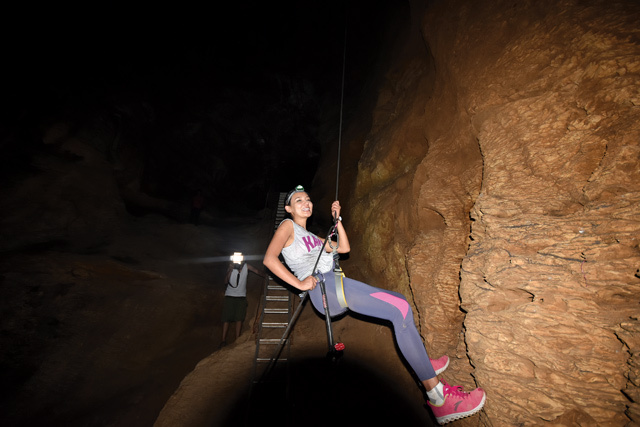 While rappelling is definitely a highlight, the end of it was only the beginning of the real caving experience. Suzana took us around a dark enclosure, and before us was an incredible indoor swimming pool, the surface dark, mysterious and mirror-still (see box). Make sure you wear shoes with a strong grip, to prevent slipping. Always wear full-sleeved tops and full-length trousers to avoid injuries and insect bites. Always bring extra devices to shed light. Our phone lights came in quite handy. If you are claustrophobic, this may not be an adventure you would enjoy. Like all caves, Siddha Gufa is full of stalactite and stalagmite sculptures formed over aeons from limestone deposits from dripping water. Their shapes sometimes give them religious significance, and others seem to resemble individuals. A few look like Lord Buddha in a seated lotus position, another is reminiscent of the Nepali poet Lekhnath Poudel, who was from Tanahu, and one is even similar to the replica of the plumed crown of the Shah dynasty. The stalagmites are regarded as symbols of Shiva, and pilgrims come to Siddha Gufa this month for a holy dip, particularly in the large pool formed in an enclosure during the monsoon.